MOST PEOPLE WOULD like to see Michael D Higgins serve a second term as President, according to a new opinion poll. The poll, carried out by Ipsos MRBI for the Irish Times, surveyed 1,200 people earlier this week. Almost two-thirds of voters (64%) said they would like Higgins to remain in office, while 29% disagreed and 7% were unsure. Of those who believed Higgins should serve a second term, 64% said he should return to office unopposed, while 32% said they would like to see an election when his seven-year term ends next year. While running for President in 2011, Higgins said he would only serve one term. However, in recent months, he has hinted he may seek a second term. Earlier this year, independent senator Gerard Craughwell said there should be a presidential election and that he would be running for the position. 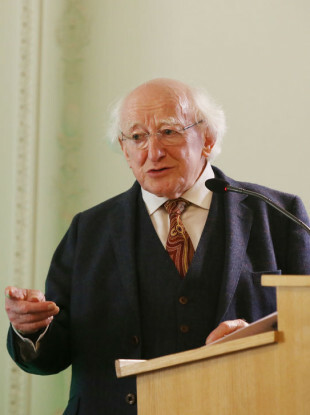 Poll: Would you like to see Michael D Higgins run for a second term as President? Email “Most people want Michael D Higgins to serve a second term as President ”. Feedback on “Most people want Michael D Higgins to serve a second term as President ”.